We create a real-time profile based on your data on GitHub, Stack Overflow, and other well-known sites. Then all you have to do is focus on improving your skills, while recruiters focus on connecting you to the best matches. Based on contributions we create a GLOBAL rank of coders. See how you compare to your friends or other coders worldwide. Can you make the top 100 in your country? Top 10 in your city? What about no.1 in your programming language? Check how many people have already been ranked in your city/country, or ranked by technology. Check how your daily coding activity affects your contribution. Our real-time update feature tracks your progress in global and local rankings. Every day, every hour, with every line of code. You should be focused on coding, not updating your paperwork. A CodersRank profile is all you need to show off your credentials. And, with private view, you can share only what you want others to see. 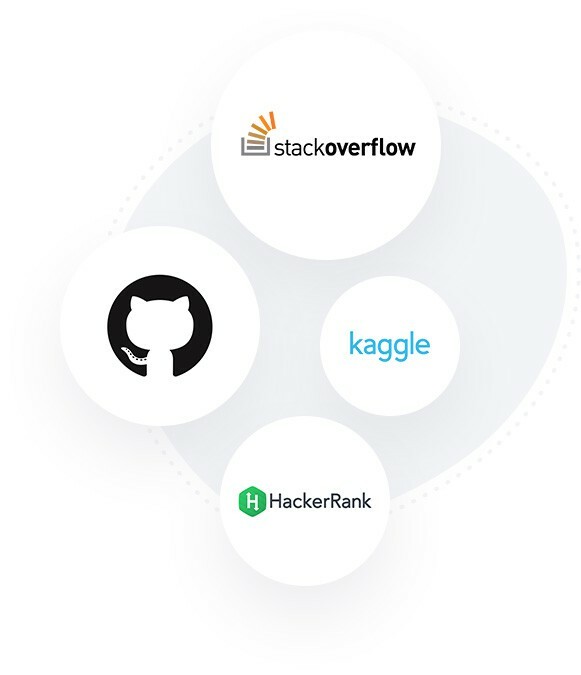 GitHub, StackOverflow, Kaggle, HackerRank and so on. We’re constantly expanding the number of integrations to make your profile as accurate as possible. Job offers targeted to you. No bullsh*t. No spam. We act as your gatekeeper. You'll only get matched if a position meets your expectations or if you decide you want to start a new career. Java, Python, C++; full-time, part-time, remote; Rio de Janeiro, Berlin, Tokyo – we listen to your needs. From auto-updates to our ranking algorithm, all CodersRank services are designed with your security at their core. Our goal is to support your professional growth. You’ll always have free access to our platform – for more and more personalized improvement opportunities. "CodersRank picked up the details from my Github commits, and ensured my profile was up-to-date. This way people can find me for the latest gigs." "Thanks CodersRank. I have been tired of having to prove each time that I know my job and I am not another one that has come to fill a position with Flying Biography and Air for Knowledge!" Have a question about this position?